A young Omani man stares off into the distance of the desert of Sharqia. your friends will likely ask you, looking puzzled. “Amman… isn’t that in Jordan?” your friends would muse, more to themselves than to you. “Oh!” your friends will exclaim, not knowing what to say. The sun sets behind the old city of Muttrah, one of the oldest ports in the Middle East. Few people in the United States (or many other places outside the Middle East) know where Oman is. Word to the wise: the easiest way to tell people where it is is to start your explanations with “it’s close to Dubai.” Indeed, the Sultanate of Oman occupies little space in the imaginations of those who have never visited. In a world where many places have lost quite a bit of their mystery, Oman still offers surprises. When you land in Muscat, you might wonder whether you’ve chosen the right destination. You’ll see low, modest white and beige buildings on almost every street and mostly unassuming architecture. The guidebooks will tell you to visit the architectural highlights, the Grand Mosque and the Royal Opera House. These buildings are beautiful, but you’re not here for that. Oman’s magic lies off the beaten path. Bioluminescent algae glows after fresh spring rains, off the coast of Sifat Al Sheikh. The village of Bilad Sayt sits in the shadow of the Hajar mountains, brimming with crops. A lone green sea turtle marches towards the sea shortly after hatching at Ras Al Jinz. Misconceived generalizations about the Middle East are plentiful. But Oman is, in fact, widely regarded as one of the safest countries in the world. Though Oman is certainly not a perfect country, the Sultan—who has ruled for over 45 years—has followed a philosophy of tolerance and acceptance that has minimized ethnic and religious strife in his country. In addition to the fact that there has never been a terrorist attack inside Oman, a tight security apparatus and efficient law enforcement keeps crime astonishingly low. This safety and tranquility gives visitors and residents alike an incredible freedom. Instead of remaining in Muscat, rent a car and borrow or bring along some camping gear. Then, set off on the open road toward the south. Most of the land in the Sultanate of Oman is public property and open for hiking and camping. Pick a sandy beach or a rocky cove that strikes your fancy and set up your tent. With the exception of clearly marked private property or government facilities, if you can drive there, hike there, climb there, or swim there, you can probably camp there—no permits or reservations needed. Travelers set up camp under the stars on the remote island of Masirah. “Ok, so it’s close to Dubai. Is it all sky-scrapers and malls? I’ve heard it’s just one big giant theme-park there, or like Las Vegas (but without gambling, alcohol, or strippers),” your friends might venture to guess. Leave the capital and you’ll soon find that traveling in Oman could not be further from the truth. Though the Sultan has transformed the country into a thoroughly modern nation in less than half a century, many Omanis continue to observe local traditions with pride. 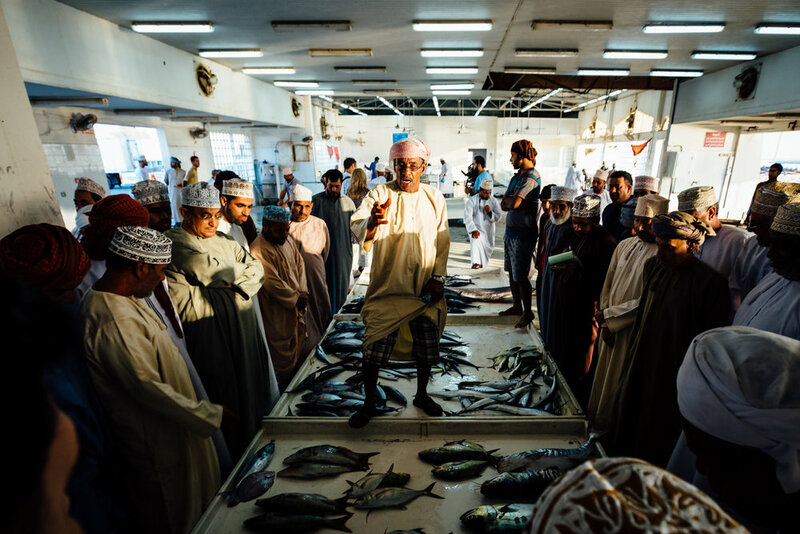 Do you fancy watching a live fish auction in the fishing village of Quriyat? 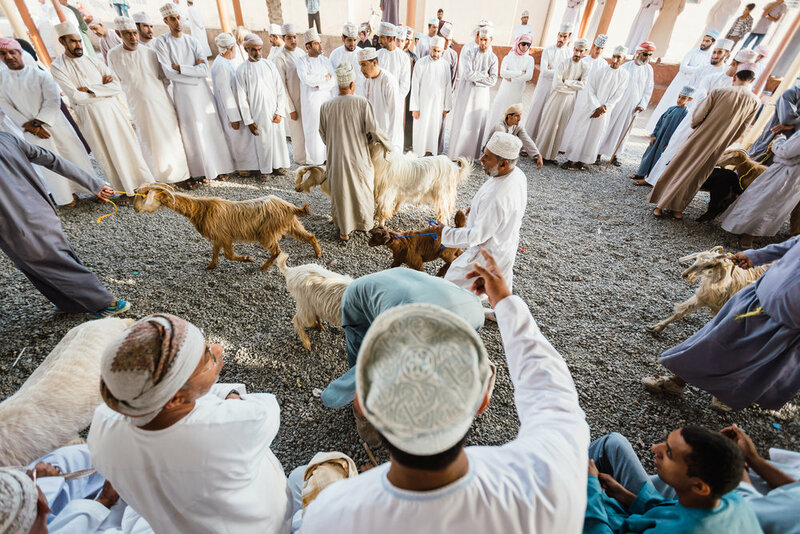 Perhaps you’d like to see Omanis buying and selling livestock, much as their ancestors have for centuries, in Nizwa? If you’re lucky, a local in the outskirts of Muscat might clue you in as to the location of the next Friday afternoon bull-fight. What’s interesting is that Omanis do not orchestrate these traditions for the benefit of their visitors. Indeed, in some instances you might find you’re one of few foreigners there. No, these gatherings and spectacles are simply the way many of these men and women have lived for centuries. Though the Sultan has built world-class roads and laid down modern communications infrastructure, the people of Oman have not forgotten their traditions. Indeed, how could they? Many of them were still alive at a time when Oman had but a single stretch of road, a single school, and only two hospitals in the entire country. Many Omanis find great joy in sharing these traditions. Once more, you will have the pleasure of proving this misconception quite wrong. Omanis are perhaps some of the friendliest and most down-to-earth people in the Gulf. If anything, the only thing to worry about is that your Omani guests will treat you with such friendly hospitality that you might find it difficult to leave. This is especially true after they’ve invited you in for some coffee or a meal in their homes. And when you ask them about their country, their history, and their daily lives, they will be glad to answer you in detail, with beaming eyes and a wide grin. Many of them will also be just as happy to go about their business as you enjoy their beautiful country. Women in Oman’s rural areas often dress in bright colors. A boy dives off a dock into the cool waters of the ship-building village of Sur. So if you’re hoping to discover a bit of magic in your travels, consider visiting the Sultanate of Oman. It is not what your friends think. It is very different to Dubai. It is not the Middle East you hear about in the news. It is waiting for you to explore. Born in the United States and raised in the city of Tijuana, Mexico, Daniel is a diplomat by day, and a photographer by night (and often by day, too). He's usually got a camera in his hand, or a podcast playing on his headphones (or both). If you, too, prefer adventure over luxury, drop him a line at daniel@durazophotography.com; he'll love to hear from you. You can learn more about Daniel on his website or visit his beautiful Instagram feed.